It's no mystery, by now, to whomever reads this blog , that I love seafood. Seafood is, for the most part extremely healthy. It is also very versatile, in the way that it can be prepared in a multitude of ways with different combinations and ideas, according to everyone's creativity. I'm also a big fan of shellfish and I like the fact that you can find different kinds of seafood in different parts of the world. It gives us a nice excuse to travel around. ( I know TV is already saturated with food adventurers and travelers of every sort..) This particular pasta I'm introducing finds its roots in the Adriatic Sea. There are a lot of different varieties of shellfish, but the best scampi were to be found on the Dalmatian coast in the past 100 years, specifically on the waters adjacent the city of Fiume, once Italian now belonging to Croatia, named Rijeka. We settled for a more modest quality of scampi, but the process and the different ingredients are a perfect combination to give this delicious plate a variety of flavors, whether is summer or winter. Start by letting the oil simmer in a large pan and add the two garlic cloves, until they get golden color. Add the scampi one by one. Let them cook slowly for ten minutes, gently moving them from side to side. At this time it is also a good idea to put the pasta to boil on a separate pot. 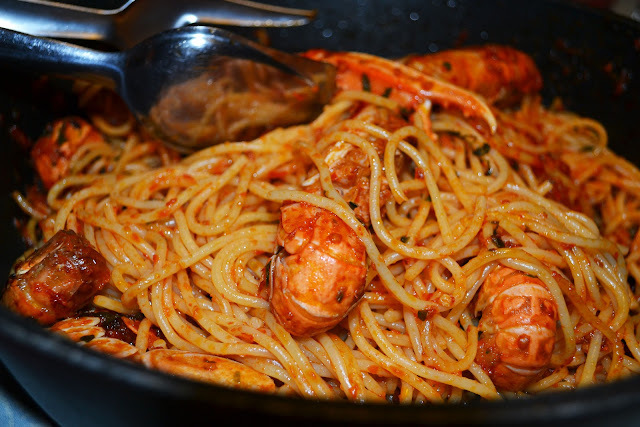 Make sure you read the cooking time for the pasta, to avoid having overcooked , mushy spaghetti. When the scampi reach a nice pink color, you can add the wine, slowly pouring it around the whole pan. Let the wine evaporate gently for about three minutes. Then, sprinkle the breadcrumbs around the scampi and next the parsley, always trying to spread it evenly. The last step is to add the tomato sauce with a large spoon. After the sauce with the tomato has simmered for five minutes, it is now time to add the spaghetti, which should have been already cooked and strained. Mix gently the pasta with the scampi and sauce and serve with a nice chilled white wine. check out the video of this recipe on our youtube channel !